Amtrak's Adirondack runs daily, both ways, between New York City's Penn Station and Montreal. The northbound and southbound trains both leave early in the morning and arrive at their destinations in the evening. This allows passengers to enjoy some impressive scenery along the way. The conductor announced that the train had been named by National Geographic Traveler magazine as having one of the five most scenic routes in the world, which, he noted, put it in the same category as the Orient Express. If only its accomodations were as posh as those on the Direct-Orient, to use (for you persnickety railfans) its proper name. 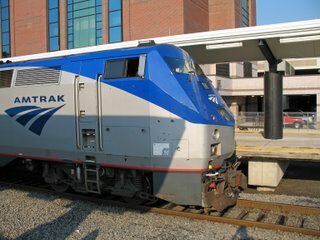 Nevertheless, for Amtrak, this is a pretty good operation. The equipment is standard, i.e. basic aging Amfleet coaches (this route cries for domes; alas, tunnel clearances don't allow them) (Update: According to Trains magazine, a dome car will be added to the train during the fall foliage season, but only for the route between Albany and Montreal, where tunnel clearances are sufficient), but the crew, at least on this run, was top notch. Rating special mention are Pat, the conductor from Albany to points north, whose thirty-eight year career extends back to the days when passenger service on this part of the route was provided by the Delaware & Hudson, and the cafe car attendant, identified by his badge as Mr. Graves, whose limited counter space and food-heating facilities were taxed by a crowded train, but who dealt with the impatient and sometimes cranky passengers with grace and humor. Subway delays meant I made the Adirondack's 7:45 A.M. departure with seconds to spare, so I was forced to take an aisle seat. Consequently, I wasn't able to get photos of the first stretch of great scenery: the Hudson valley between New York City and Albany. 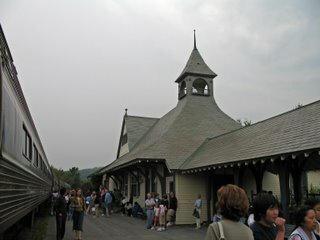 As we approched the Hudson Highlands, the conductor announced that volunteers from the National Park Service would give a narrative about the historical and geological significance of the places we were passing, and that those wishing to hear it should gather at the rear of the cafe car. 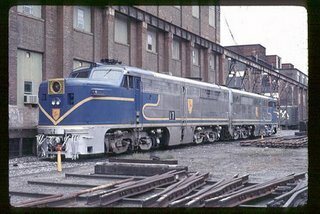 By the time I got there, all the seats were taken, so I returned to my coach and waited until we reached Albany/Rensselaer, a division point where there's both a crew and engine change, the latter meaning we swapped one GE Genesis type loco for another. I later learned why: D&H's PAs were purchased from Santa Fe, so the paint scheme they bore was basically a matter of putting blue over red. Indeed, I may have seen these same PAs heading AT&SF's Grand Canyon at its terminus when my parents and I visited the Canyon several years before. The PA is regarded by many railfans as the best looking diesel ever made. To my eye, the Genesis (see left), while not so handsome as the PA, has a similar austere elegance. It's certainly an improvement on the clunky looking FP-40 that preceded it. 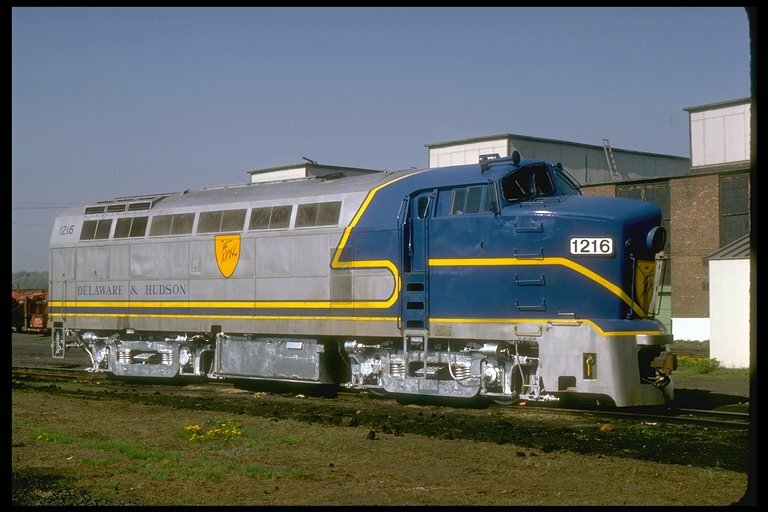 Its sculptured lines suggest my own favorite of the first generation diesels, the Baldwin "Sharknose" (see photo below, by J. Hunt, again courtesy of Exotic Diesel), minus the nose. After leaving Albany/Rensellaer station, we crossed the Hudson just north of downtown Albany, then headed west to Schenectady. Following a stop there, we turned north again towards Saratoga. 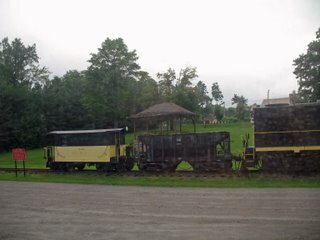 Shortly after, Pat the conductor announced that a National Park Service volunteer would be in the front coach to talk about sights along the way. This time, I was able to find a seat. The volunteer, Dave, was a high school teacher from Schenectady. 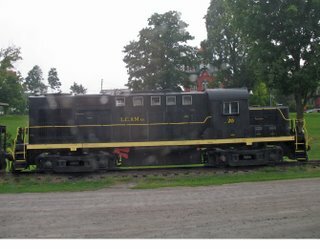 The first thing he said after I took my seat confirmed what I had suspected, that the abandoned industrial complex we had passed just after leaving Schenectady station was the American Locomotive Works ("Alco"), birthplace of the PA and many other steam and diesel locos. As we approached Saratoga, Dave talked about the significance of the Revolutionary War battle fought there, in which Benedict Arnold, along with Horatio Gates, got credit for a victory which thwarted the British plan to isolate New England from the colonies to the south. He then discussed theories about Arnold's later turn to treachery, noting that the most plausible was his wife's hatred of their subsequent post at West Point. Arnold had sustained a wound at Saratoga that necessitated the amputation of his right leg, and there is now a monument at the Saratoga Battlefield National Historical Site to that booted leg, the only part of him, as Dave said, that never betrayed the revolutionary cause. A short time after leaving Saratoga, we re-crossed the Hudson, now running almost west to east after descending soutwestwards from its source in Lake Tear of the Clouds, in the High Peaks region of the Adirondacks. What you see in the photo on the right is just the southern part of the river, as the far bank is Rogers Island, a place steeped in the history of the French and Indian War, as well as the ancestral home of the U.S. Army Rangers. North of Rogers Island our route was parallel to the Champlain Canal, which connected the Hudson with Lake Champlain. 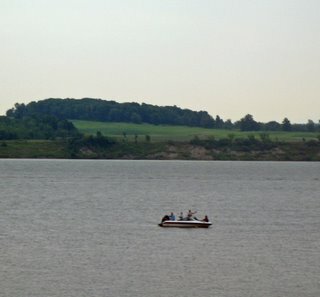 This, along with another short canal bypassing rapids on the Richelieu River, through which Lake Champlain drains into the St. Lawrence, enabled watercraft to travel from New York City (or, later, after completion of the Erie Canal, from Buffalo and points on the Great Lakes to the west) to Montreal, or down the St. Lawrence to Quebec City. As we continued northward, the canal broadened into what seemed a wide river, but was actually the southern part of Lake Champlain. The woods and green pasture on the opposite bank are in Vermont, which, as Dave noted, was not one of the thirteen rebellious colonies. In fact, it was for a time an independent republic. a shot of the still functional Victorian depot there. 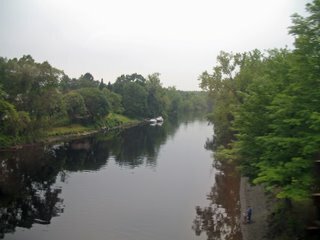 Shortly after Port Kent, we reached my destination, Plattsburgh. The following afternoon, I got the photo below of the southbound Adirondack arriving at Plattsburgh station. 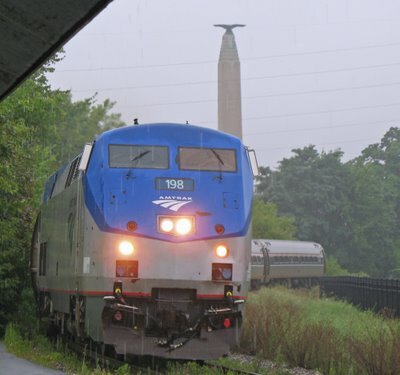 The monument in the background, surmounted by an eagle, commemorates the Revolutionary War capture of Fort Ticonderoga, which lies some seventy miles to the south, and is briefly visible from the train. Update: for more photos and text from a later journey on the Adirondack, see here For a video showing scenery along the lower Hudson Valley taken from the train, along with an interview of your correspondent by a Wall Street Journal reporter, see here. Clyde Tombaugh: a distinguished life in astronomy. The decision by a council of astronomers meeting in Prague to demote Pluto to "dwarf planet" status brings to mind the remarkable man who discovered the little devil some seventy six years ago. Clyde Tombaugh secured his job as an assistant at Harvard's Lowell Observatory on the strength of some sketches of planets he had made based on observations through a home-made telescope. He was only 24 when he compared some photographic plates and noticed a dim object that moved in the manner to be expected of a distant planet. He has ever since been remembered as the discoverer of Pluto, but, as this brief biography points out, made many other contributions to our knowledge of the universe during his long career, including delineating a supercluster of galaxies spanning the sky from Andromeda to Perseus. Here's hoping that the reclassification of Pluto doesn't dim the memory of this fine man, who died nine years ago at the age of 90. 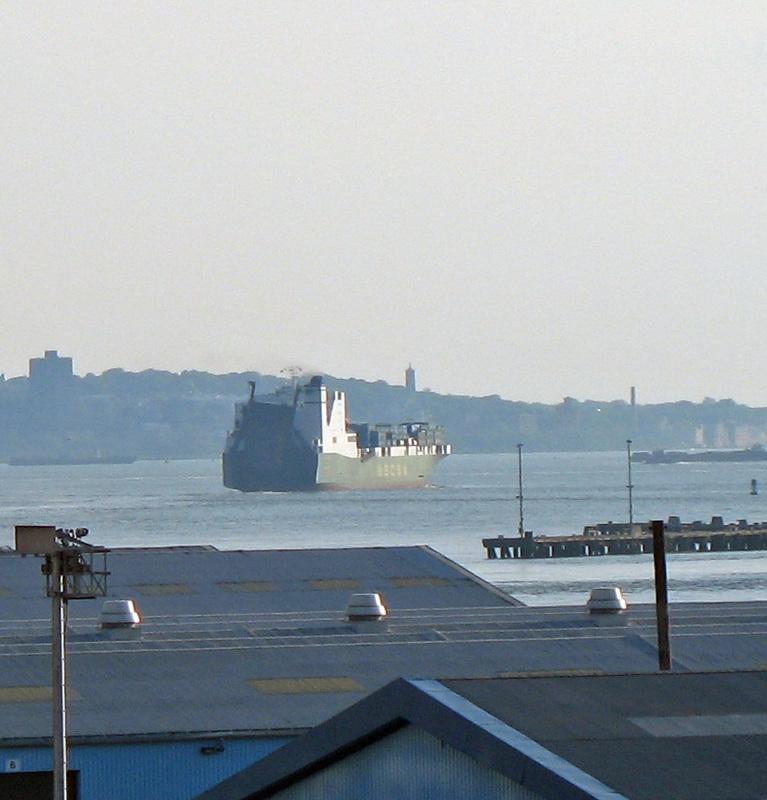 A Brooklyn blog well worth a visit. Through the medium of the excellent and useful Brooklyn Heights Blog, I've discovered a unique blog called runs brooklyn/brooklyn runs. It's the baby of one Gary, a fortysomething recent arrival (from New Jersey by way of Iowa) in the Borough of Cherce, who has made it his project to run every block of every street therein. His descriptions of the neighborhoods he runs through are tasty slices of cake, and his superb photographs are the icing. Good news for the Mets. It now appears that Tom Glavine will be able to pitch again soon. Nevertheless, it's still an open question whether either he or Pedro Martinez will be in top form for the post-season. Evening update: Mets survive John Maine's inevitable Dark Night of the Soul (I hope John does, too), coming back from a 7-1 deficit to win 8-7. Nights like tonight, it looks like 1986 again. Nevertheless, I have to agree with Tim Marchman's assessment. Unfortunately, it appears that, if the Mets do get to the Series, they won't face the same opponent as in '86. Out of the frying pan ... ? As seen from the Brooklyn Heights Promenade, on the hot, hazy afternoon of July 30, a Saudi ro-ro/container ship sails from the Red Hook terminal. Next stop Jiddah?